Made by a French developer where the characters were created and are very popular, it's faithful to the tradition of parody that runs throughout the Asterix stories. Atari's latest Asterix offering is an explosive video game crammed with surprising encounters that parody the greatest icons of the video game world and is awash with wry references to many of the great moments that have marked over 25 years of video game history. 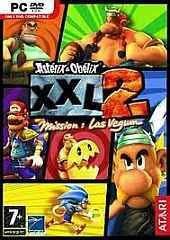 Asterix & Obelix XXL 2: Mission Las Vegum takes you on an action-packed tour of the astonishing "Las Vegum" theme park. In this original scenario, Getafix the famous druid is behaving very strangely, and all the other renowned druids of the Roman Empire have disappeared. Las Vegum, "the city of games," is the brainchild of the visionary Julius Caesar. Its labyrinthine streets will lead you through the districts of Little Paris, WCW, LuckSore, Little Venetia, Pirate Island, and even SeizeUs Palace. Along the way, the programme for Caesar's farcical festivities is packed with pumped-up Romans alongside some curiously familiar characters paying tribute to the wider world of video games. And who other should top the bill than Centurion Larry Craft – who insists on jumping around in canvas shorts, rather than wear a skirt like everybody else. Fortunately Asterix and Obelix can count on the aid of a repentant Roman spy with inside knowledge of new-fangled techniques: Sam Shieffer. A Remastered Edition was released in Nov/2018 with Enhanced graphics: New textures and models for all characters and enemies; New textures and lighting for environments. Improved gameplay: A new system of store that changes and adds upgrades compared with the original game. These stores are located in the six game environments and allow players to increase their skills thanks to new techniques, combos and Furies. This system is similar to a conventional skills tree. Cosmic Strike and Pantry: two new skills to help overcome enemies. Health bar upgrade: the health bar can be upgraded as the player progresses through the game in order to reach a higher maximum health level. Addition of three difficulty levels: easy, normal and hard. A new addition to the remastered version: challenges. Challenges are bonus missions focused on fighting. The aim is to beat as many Romans as possible within a given time. There are two challenges in each of the six game environments, making 12 in total. The bronze rank is easily accessible and is a good way to earn money but reaching the Gold rank is a real challenge. A new collectibles system: Postcards are now hidden in the levels, collecting all of them requires to fully explore the game. Figurines, now in 3D, can be unlocked in the shop. A new Fast Travel system: once you unlocked a level, you can easily go back thanks to fast travel and find the missing collectibles.